(BPT) - Why do you want to remodel your kitchen? Sure, the cabinets date back to the disco era, but the doors and hardware all still work. Your stove may be older than your college senior, but you can still bake a batch of chocolate chip cookies in it. So why invest the time, money and emotional capital in renovating the most-used room in your home? If you're like most Americans, you'll undertake a kitchen renovation to make your life easier and happier. In a Houzz survey, 79 percent of homeowners who planned a kitchen project said they were doing it to improve the look and feel of the room, while 59 percent wanted to improve functions. The popular home improvement website Homeadvisor says that people incur, on average, $11,300 to $28,900 on kitchen remodeling projects. A kitchen faucet is a critical tool for numerous kitchen tasks, while also having a major impact on the overall look of your kitchen. 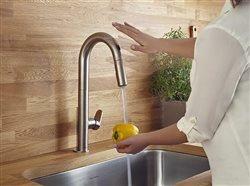 A new faucet can improve the beauty and functionality of your kitchen, and touchless options fit the bill perfectly. Hands-free kitchen faucets are easy to use for kids, seniors and people with mobility issues. Plus, they allow you to operate your faucet without spreading germs - even if your hands are messy from food preparation and cooking. Touchless faucets like the sleek, high-arc Beale Selectronic Kitchen Faucet from American Standard offer advanced flexibility to make common kitchen tasks feel effortless. You can operate this electronic faucet with a wave of your hand, or switch to manual operation by simply sliding an innovative movable door to cover the sensor when guests are visiting. Two spray patterns, plus a convenient pause feature, provide optimum functionality for casual users and home chefs alike. Anyone who has been woken from a deep sleep by a drawer or cabinet door closing loudly in the kitchen will appreciate the idea of a device that prevents slamming. When the quiet-close feature first appeared on the scene, it was considered a luxury upgrade, and one generally available only by installing completely new cabinets and drawers. Now, a variety of kits are available to turn ordinary cabinets and drawers into ones that close softly and quietly. Enhancing kitchen drawers to soft-close is as simple as emptying them, sliding them out, and replacing the standard slide hardware with a quiet-close apparatus. Silencing kitchen cabinets is even easier to do - simply add sound-dampening hardware, which is available at any home improvement store. Perhaps your kitchen storage space is simple, with a few basic cabinets on hand. Or it may be substantial, encompassing numerous cabinets, drawers and even a generous pantry. No matter the size, cluttered kitchen storage areas can seem inadequate and inefficient, especially when they spill over onto counters, where you end up storing things that don't fit into drawers and cabinets. Fortunately, a variety of budget-friendly kitchen organization solutions are available for homeowners. From cabinet racks that hold dishes, pots and pans, lids and bakeware to over-the-door racks to contain spices, soup cans, and more in your pantry. Make finding things in cabinets easier by installing pull-out racks. Under-shelf baskets allow you to use every available inch of space in cabinets, and are great for storing dish towels, place mats, measuring cups and more. Most of these organizers require little or no expertise to install. No need for a major renovation budget to achieve maximum impact with kitchen upgrades. By focusing on key areas like the faucets, cabinets and storage, you can greatly improve the look and function of a kitchen with a modest investment of time and money.